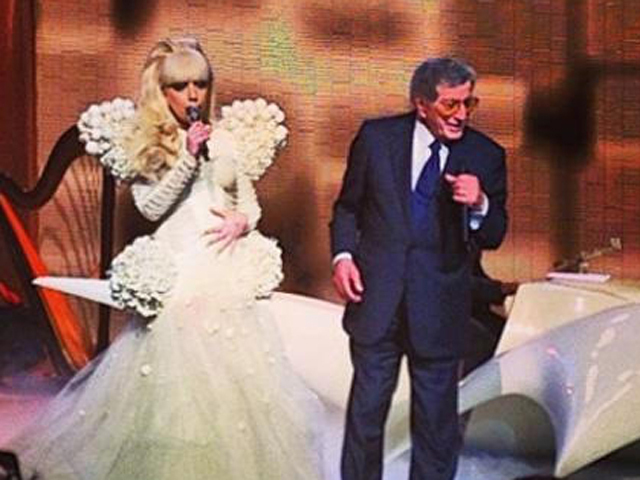 Lady Gaga's "Little Monsters" will soon meet veteran crooner Tony Bennett. Fresh off their duet at one of this week's staff inaugural balls, Lady Gaga, 26, revealed that she plans to record an album with the 86-year-old Bennett. This wouldn't be the first time Gaga and Bennett have joined forces. They recorded a version of "The Lady is a Tramp" for Bennett's 2011 "Duets II" collection. They performed that same song for the White House staff gala on Tuesday in front of 10,000 guests, coinciding with President Barack Obama's second inauguration. Meanwhile, Gaga has a busy year ahead. Her new album, "ARTPOP," will be out this spring. She's also expected to star in a film about her life and the recording of her new album.